If there was one thing that the classic G.I. Joe: A Real American Hero line offered young children in the 1980’s, it was the chance to “play” in almost any environment. The team was chock full of specialists who could not only function but could excel in some of the most extreme environments on the planet. Even better, these troopers were based upon real specializations found within the United States Armed Forces. Recondo traversed the jungles while Dusty dominated the deserts. The seas, however, were the domain of Torpedo—a Polynesian SEAL whose personality was described on his file card as that of a “cold fish”. Now, 25 years later the original Joe SEAL returns in a familiar wetsuit that had remained dry for far too long. Hasbro has really been knocking my socks off lately with their faithful recreations of classic ARAH-era figures and Torpedo is no exception. 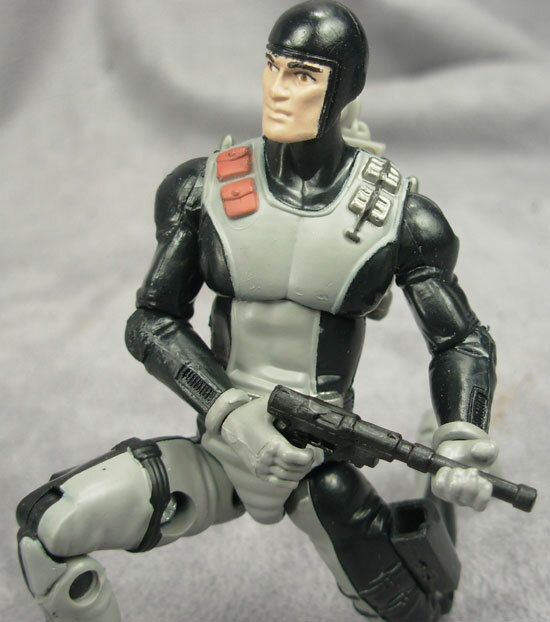 Granted, how hard can it be to replicate a gray and black wetsuit in the 25 th Anniversary style—after all, it wasn’t that detailed, right? Not so—as this new figure so displays. 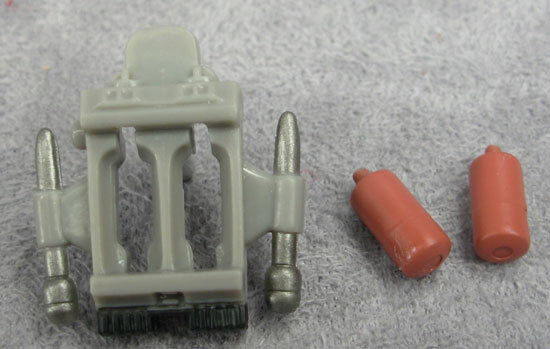 The original 1983 Torpedo mold was that of a SEAL in his wetsuit—with a few molded pouches along the shoulders as well as a few details along the outer edges of the legs. This updated design is essentially the same—there are the same pouches along the right shoulder. The left shoulder is now adorned with painted clips for Torpedo’s sidearm but more on that later. The right leg now features a functional knife sheath and the left has a working holster. The figure’s belt now has a silver and black paint application as well as a painted buckle which brings out the detail in the mold far better than the original figure did. In fact, the design takes this enhanced level of detail a step further and adds in some musculature to the abs as well as some wrinkles in “material” around the elbow joints. Whereas the original figure had a very smooth appearance this updated design is a touch more rugged—conveying a bit more realism than the 1983 figure. It’s a great example of how far toy sculpting has come in the 25 years since the original figure hit store shelves. However, I’m sure that Justin has his own take on the team’s premiere SEAL. My own take? Ooohh… yeah, I’ve got my own take. Torpedo is incredible. Absolutely incredible. One of the pinnacles of the 25 th Anniversary line to date. I never really cared for the original Torpedo, mostly due to his limited functionality and that obnoxious head sculpt, but this Anniversary version of Torpedo trumps the original in every single way humanly possible. The sculpting of the wet suit is perfect, with the seams, the pouches, and the two holsters. It maintains all of the design aesthetic of the original, but makes it consistent with the 21 st Century and just ends up being an amazing looking figure. Part of the appeal of this figure is in the simplicity as well. No overly cumbersome secondary armor or belts, just a flat out “kibble-less”, streamlined action figure with great articulation and amazing accessories. There is nothing about Torpedo that I don’t like. A great, GREAT figure. Torpedo never saw much use in my Joe adventures when I was younger. 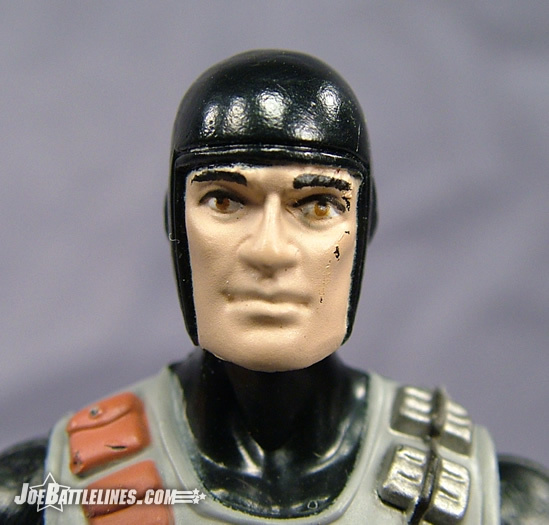 Unless the mission I was playing at the time called for an underwater specialist I just didn’t see the point using a guy in a full wetsuit with a respirator and mask permanently molded onto this face. (The same held true for the original Wetsuit figure as well.) Apparently, the designers on the line must have felt the same way because this version of Torpedo comes equipped with a removable facemask and respirator! Yes, the figure is wearing a full dive suit but at least he can toss aside his mask and appear functional OUT of the water. 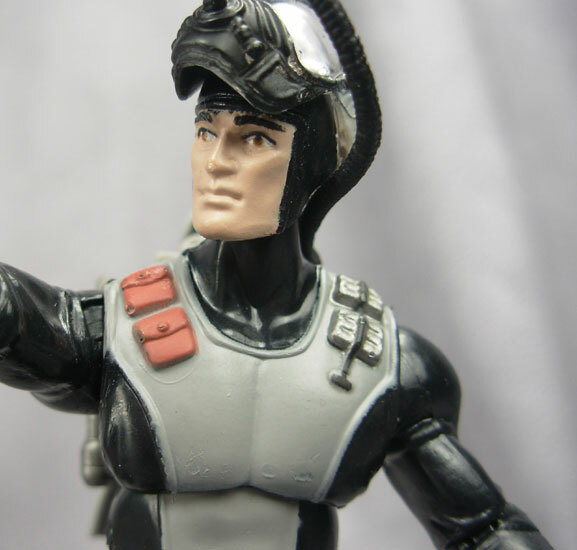 The face sculpt for Torpedo is decidedly neutral in expression which actually fits in quite well with the character description given on the file card. However, the head sculpt isn’t the most exciting aspect of this figure- that honor is reserved for the included gear packaged WITH Torpedo. Hasbro went all out on this design—and managed to replicate the original figure’s kit perfectly! 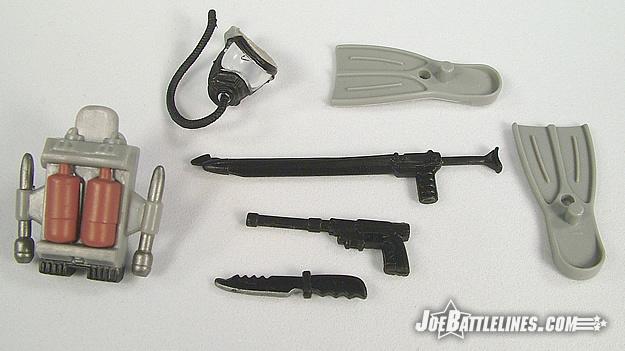 Edward Leialoha comes equipped with his spear gun, fins, and re-breather pack. Not only that but the figure is also packaged with a combat knife and a silenced pistol. 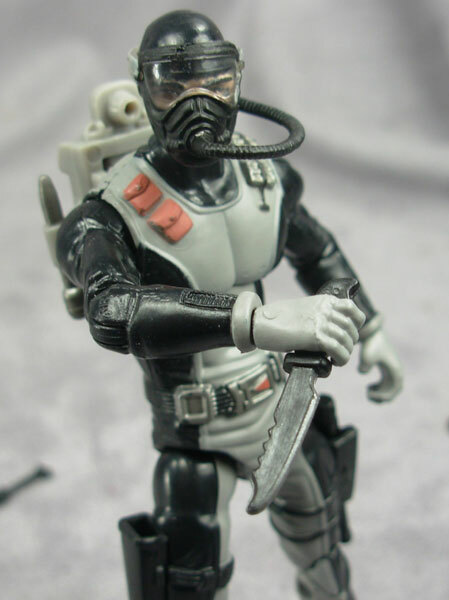 Yet Hasbro didn’t seem content just to merely update the figure’s gear by giving him a removable dive mask—they also made the oxygen tanks in his backpack removable! While I worry that the tanks might get lost if fans aren’t careful, I can’t fault the design team for the effort that was put into this figure. 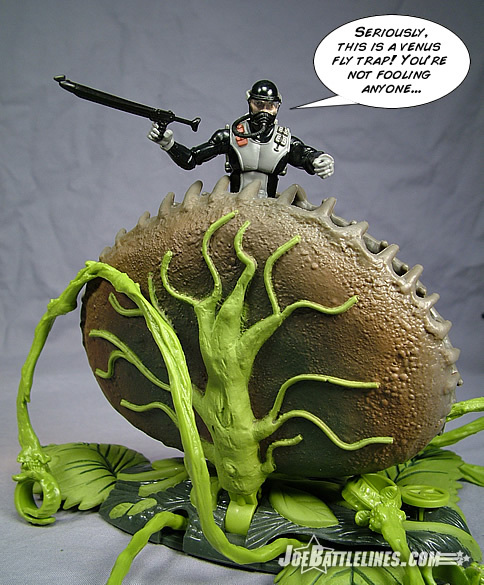 I’m so impressed with this piece that I might have to find the sculptor at the con and buy him a drink of his choice! Thoughts on the head sculpt and included gear, Justin? Both are impressive, to say the least. The removable scuba mask allows collectors to at least give Torpedo a little bit of land usage, and I dig his head sculpt, too, even though he doesn’t necessarily look all that Hawaiian. Hasbro did indeed go all out with his gear, too, replicating everything the original had and more. 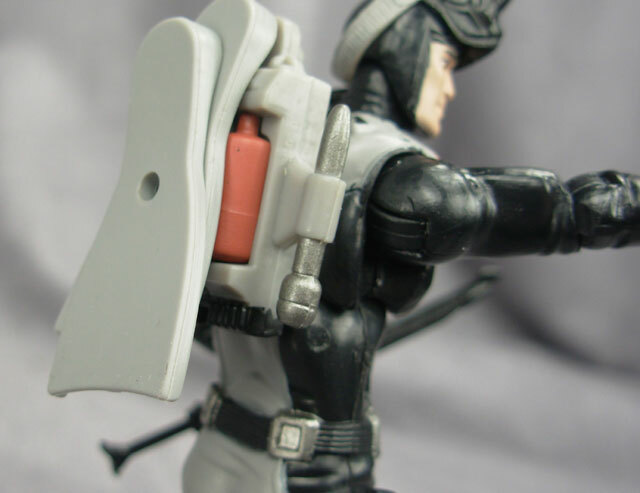 The backpack now features removable air tanks, and connects to the removable facemask perfectly. 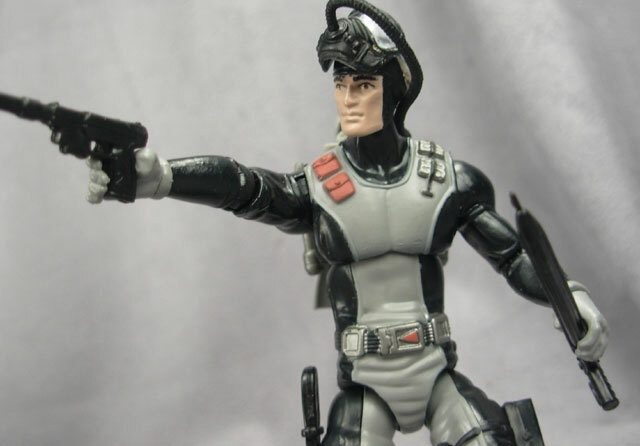 His spear gun is no longer his primary offensive weapon, as he now comes with a great removable knife and silenced pistol, both of which fit seamlessly into their respective holsters. The flippers are great, too…heck, everything about this figure is great. Whether he’s diving in the deep seas, or performing black ops on the land, he is equipped for both and looks great doing it. It’s pretty obvious by now that I like this figure a great deal. The updates to the design take “token diver” Torpedo and instead make him into a dangerous operative! 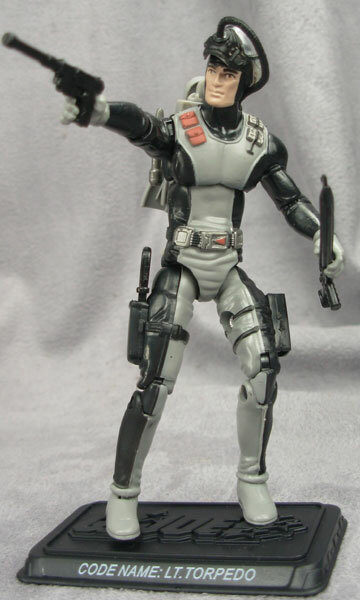 The ability to remove the face mask and the included silenced pistol produce a figure that is evocative of stealth characters like Sam Fisher from the Splinter Cell series. 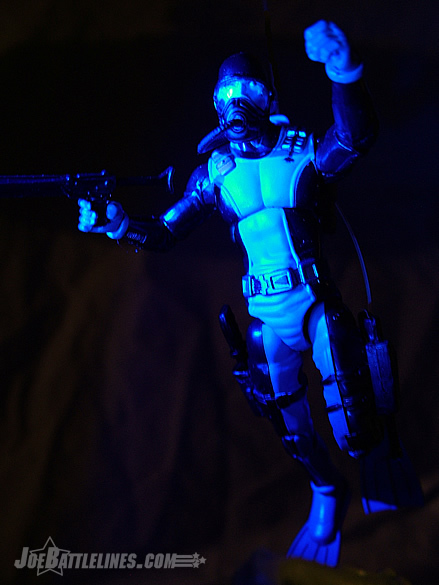 It’s easy to picture this character emerging from the dark waters, slipping onto a Cobra sea platform, removing his gear, and completing his objective in complete silence—using only his silenced pistol and knife. 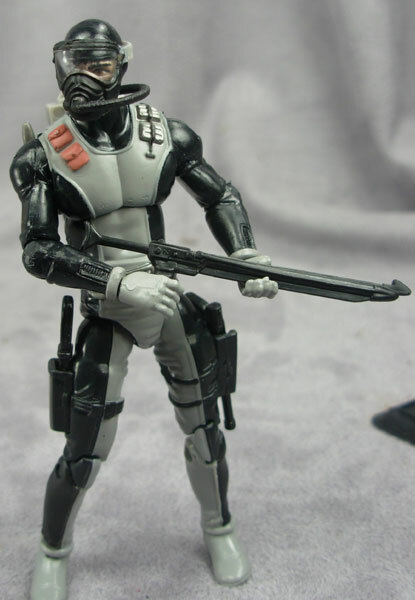 This is an example of how Hasbro can take a classic design and add to the it’s appeal by making minor updates that only help to enhance the original design. Not only that but Torpedo doesn’t suffer from the articulation limitations found in figures such as Breaker, Duke, Gung-Ho and others. While not the top-tier favorite of many fans, this is one addition to the 25 th Anniversary collection that is going to really “wow” a great many Joe fans. If Justin’s not too giddy thinking about the forthcoming Headhunters convention set, I’ll pass the keyboard over for his closing thoughts. How much more can I gush about this figure? 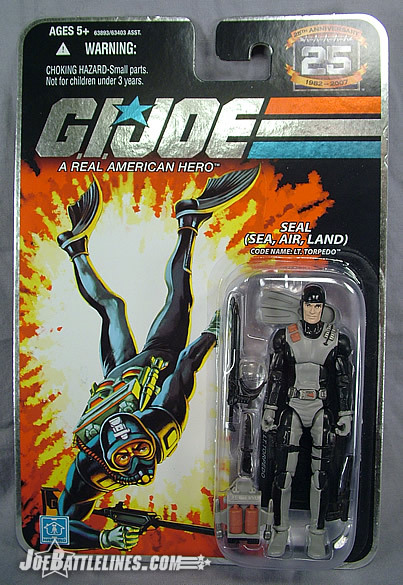 I’ve always had some issues with the way Hasbro has portrayed their Navy SEALs, considering they all seem to get relegated to underwater duty. I’ve wanted land-capable Wet Suits and Torpedos for a long, long time, and while this figure isn’t perfect for that role, he at least has some potential for doing that. The articulation, design, accessories, and heck, even the updated two-peg Battle Stand all combine together to give us a fantastic figure with a perfect accessory compliment. I honestly cannot think of a single thing to complain about, and heartily recommend this figure to anyone even thinking about diving into the G.I. Joe world. Do NOT hesitate!